I am using dasBlog as my blog engine and I originally approached the solution by trying to pull the content directly from dasBlog using the blog API. However, I soon stumbled upon a clever jQuery plugin called jGFeed. This plugin is an abstraction layer on top of Google Feeds API. This plugin can get any RSS on any host and converts the RSS feed data into JSON to make it easier to use. Using jGFeed allows you to create a summary of latest posts for ANY blog by using the RSS feed. RSS feed data is a standardized XML file format. 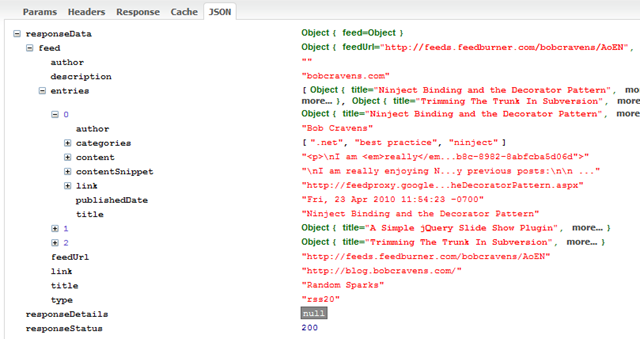 The JSON that jGFeed provides has all the information you need to create a summary. Here is a nice blog post about the JSON content. One of the best ways to see the request / response and sniff JSON responses is using the Firebug plugin for FireFox. Here is some data that I acquired using Firebug. First off here is the HTTP GET request headers. 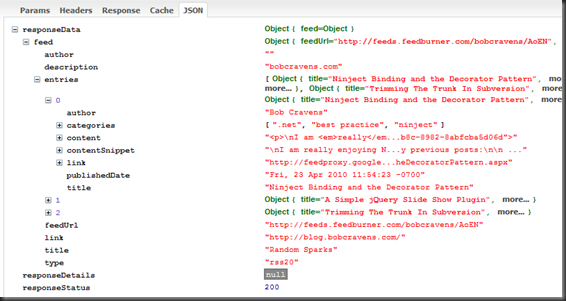 Using Firebug, you can determine the JSON variable names that correspond to the content that you want to publish. url – This is the url of the RSS feed source. callback – This is the function that is called after the data is returned. number – This is the number of RSS elements you want to return. The rest of the script uses the JSON data to build HTML DOM elements and append them to our placeholder. Adding an RSS feed reader to a web page using the jGFeed plugin for jQuery is simple and straight-forward. This solution allows feeds from various sources (not necessarily your blog) to be aggregated into a single page. give me a helping hand, i trying to upgrade jgfeed to a more specific plugin to set a feed to any jquery object. how can i get back a return value, in this example var html in the end to call $(“#feedContent”).append($(html)); from outside of the function? if i dont wanna hardcode $(“#feedContent”) but pass as an object? thx! Glad to try and help, however, I don’t understand your question. Can you clarify a bit? 1. Put your feeds into an array of objects. This allows a callback function to be associated with each RSS feed. 2. Inside jsFeed, use that callback function to pass the feeds out and process them. kind of notation, this array of object is the options of the jgfeed plugin? The array of objects is used as an input to the function that wraps jgfeed. You could expand the objects to include additional info if you wanted. Thank you very much for your technical knowledge sharing. Just to help on your text, I spotted a typo in the last paragraph before the summary. Thanks for the positive comments and the typo alert (which I fixed). do you know how i get all content of one feed? but in xml file, the feed description don’t show all content of a determined post. XML file is returning only 1000 characters, but the original post has more than 1000 charactres. I would like to get all content. do you know how to do this? Thank you for this excellent example. Do you have any advice on getting the “publishedDate” to display without the awkward time stamp? It seems to be stripping the target=_blank tag from my description html. Any thoughts on how to fix this and get links inside the description to open in a new window? Thanks! Sorry for the late reply. I am really not sure why that is happening.